By Steve Bryant on Thursday, 28th August 2008. 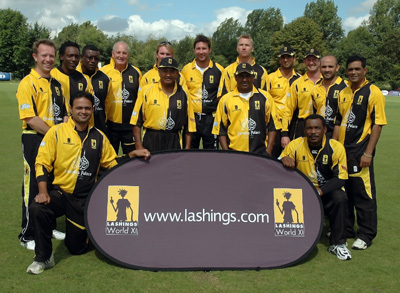 The Lashings World XI team were once again in Haverhill on 21 August 2008 to meet Haverhill CC at Manor Road Cricket Ground. Fortunately the rain that that dampened everyone's spirits at last year's match didn't appear this year and spectators were treated to a thrilling game of cricket. The Lashings World XI team featured some of the greatest names in cricket including former England Test players, fast bowlers Alan Mullally and Ed Giddins and the spin bowler John Emburey. Also lining up in the Lashings World XI this year was Pakistani fast bowler Mohammed Akram, Zimbabwe opening batsman Brendan Taylor and the great Richie Richardson, who Captains the prestigious visiting side. The Lashings World XI team won the toss with former Indian all rounder Dinesh Mongia electing to bat first, partnered by top former Sri Lanken batsman, Aravinda de Silva. What looked to be a dominant first partnership was broken apart after only five minutes when de Silva was unceremoniously caught by Darren Poole off Joe Woodly's bowling for just a single run. This amazing start gave the Haverhill eleven a huge boost in confidence - things could not have looked better for the team. However, the partnership between Mongia and de Silva's replacement, the amazing Sri Lanken batsman Marvan Atapattu racked up a very impressive 124 runs between them before the opening batsman was finally caught by man-of-the-match Adrian Dellar off the bowling of Simon Youngs. But celebrations were short as this dismissal opened the way for the Lashings Captain, the former West Indies all-rounder and all-time-great, Richie Richardson to charge his assault against the Haverhill bowlers. With a demostration of his incredible batting prowess Richardson batted a very respectable 71 runs including six boundaries and five massive crowd pleasing sixes! The Captain's reign was eventually stopped by Darren Poole who by this time was having a great match, taking his second wicket and proving that his bowling was every bit as good as his fielding! After a surprisingly short innings by Dickens, scoring only 2 runs courtesy of Sam Powell's terrific bowling the Lashings World XI finished their 35 overs with an impressive final score of 288 for 5 leaving both Brendan Taylor and Chris Harris not out at the crease after for 50 and 22 respectively. Following an excellent hospitality lunch hosted in a grand marquee next to the clubhouse it was time for Haverhill CC to take to the wicket! Neil Winter opened the batting for Haverhill CC partnered by Scott Webb and the pair immediately faced a bowling onslaught from Pakistani fast bowler Mohammed Akram and England fast bowlers Alan Mullally and Ed Giddins. Despite the impressive display from some of the finest bowlers in the world, Winter hit the ball all over the field, scoring a total of eight boundaries before being caught by Lashings Captain, Richie Richardson for 42 runs. On came man-of-the-match Adrian Dellar to partner Scott Webb who was unfortunately stumped shortly after by Brendan Taylor. Dellar carried the charge forward hitting four magnificent sixes and seven fours before being caught out by Atapattu for a fantastic score of 69. 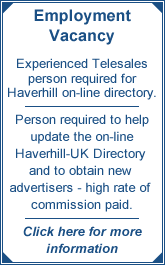 With Bill Moran and Sam Powell scoring another 23 runs before caught out by Taylor and Mullally respectively, Haverhill CC had added an outstanding 149 runs onto the scoreboard… things were looking good! It was down to the young all-rounder Dan Poole to step up to the crease and lead the batting charge forward… and disappoint he did not! Despite being only 19, Poole showed a maturity that even impressed the test-seasoned players as he pushed on to reach a fantastic 49 runs including five boundaries ad two big sixes. Although Dan was a little disappointed not to reach his fifty, he knew what a great job he had done and was applauded by both teams as he walked back to the dressing rooms waving his bat to the crowd in approval. However with Simon Youngs out for 6 runs the match was sadly slipping away from the Haverhill team and despite a Herculean effort by all the players it was not to be. With only two overs left for the partnership of Dan and Martyn Wilkins to score with, the match ended just after 7.00pm with the two players not out at the crease for 15 runs between them. The final score after 35 overs for Haverhill CC was a very respectable 227 for 7, a mere 61 run short of the Lashing XI total. All in all though it was a terrific day's play that was thoroughly enjoyed by both the teams and spectators alike and Haverhill CC would like to say a big thank you to the match Umpires; Phil Jones and Martin White and the Scorers; Steve King and Paul Webb and everyone who attended and made the day such a success. An enormous thank you goes to all the days' sponsors, in particular the main sponsor HID for their generous support. An estimated figure of just over £5,000 was raised on the day which is a huge effort and will go towards making sure that Haverhill CC continue to produce the top-class cricketers we saw on display here against the Lashings World XI… which just leaves the final thank you to them! What great sportsmen they are… here's to the 2009 match!